Hatters boss Mick Harford has backed striker Danny Hylton to end the longest goalscoring drought of his Luton career. The forward has not scored since his hat-trick against Accrington back on October 23, some four months and 16 appearances ago. He has been out with injury and two suspensions in that time, but has now started the last three games alongside James Collins in attack. On Hylton, who has netted 55 goals for the club, 27 in his first season and 23 last term, Harford said: “Danny’s working hard in training, he's always at it, always flat out in training, like most players are. "A goal would be great for Danny, a goal would be good for anyone as it gives confidence to them. "He’s not shy of confidence Danny and he’s training, very, very well. With Kazenga LuaLua now back fit after forming an impressive partnership with Collins in Hylton’s absence, Harford faces a selection poser ahead of this weekend's home clash against Rochdale. 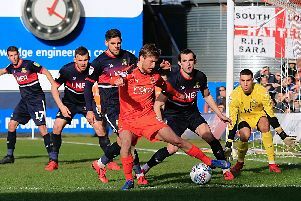 Whoever he picks, the Luton chief expects LuaLua to have a major influence in the final 12 games, adding: "Kaz has been great around the place. "It took him a long time to get himself into the team, he came into the team and did ever so well for us. "He made a big contribution to what we were trying to achieve here, so we’re delighted with Kaz. "He'll hopefully play a big part towards the end of the season."